We’ve had an abundance of apples and pears from our CSA share (Community Supported Agriculture) lately. Usually when this happens it’s time for apple and pear butter. All you need are 6 – 7 lbs of fruit, spices and a crockpot. For this, I used my 5.5 qt. crock pot. Warm apple and pear butter goes extremely well over vanilla ice cream or on hot toast and waffles. You can honestly leave this to cook overnight for 7 – 10 hours and you’ll wake up to your apartment smelling like friggin’ Christmas. It’s amazing. Adapted from All Day Apple Butter at AllRecipes.com (I *greatly* reduced the sugar from 4 cups down to 3/4 cup). Place apples & pears in a slow cooker. Add sugar, cinnamon, cloves, nutmeg and salt to the slow cooker and mix well. Cover and cook on low 7- 10 hours or until thickened and dark brown. Stir occasionally to mix spices and snort the goodness. After finished, if desired, blend with an immersion (stick) blender until smooth. Spoon into 1/2 pint Ball jars like I did or into freezer containers, leaving 1/2-in. headspace. Cover and refrigerate or freeze. 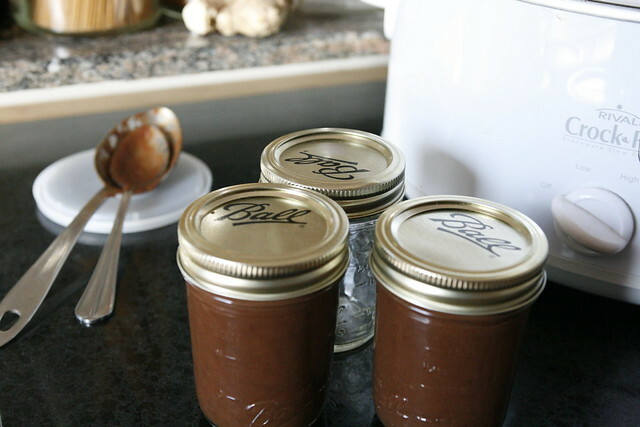 The apple butter will keep in the Ball jars for an extremely long time in the fridge without officially “canning” it. One of my friends was all stingy with hers and made three jars stretch to 8 months. If you have way too much, you always give some away or make the insanely good Apple Butter Pie. YES. What are some of your favorite fall recipes or ways to use up extra fruit?